The referee has been announced for Saturday’s Midlands derby in the televised evening kick-off at Molineux. The referee has been announced for Saturday’s SkyBet Championship clash between Wolves and Aston Villa. Tony Harrington will take charge of the evening kick-off at Molineux, which will be televised live on Sky Sports (KO 17:30 GMT). The Cleveland whistler has will be assisted for the Midlands derby by Ian Cooper (Kent) and Timothy Wood (Gloucestershire), with Jeremy Simpson (Lancashire) acting as fourth official. Harrington – a Select Group 2 referee – will oversee his 21st game of the season in all competitions this weekend, which will be his 16th in the second tier. He has so far brandished 87 yellow cards, sent off two players and awarded two penalties. The Hartlepool-based official has encountered both sides on previous occasion each this term back in September – in Wolves’ 2-1 defeat at Wigan and Aston Villa’s goalless draw at Ipswich. Harrington was the subject of criticism from Newcastle boss Rafa Benitez after his side’s victory over Cardiff in November for not protecting his players enough. After four years as an EFL assistant referee and four years in the National League and National League North, he was promoted to the Football League referees list at the start of the 2012-13 season. Despite collecting the most bookings in the league this season, Villa are yet to receive a single red card – a statistic which could change in the hotbed of a derby atmosphere, albeit Harrington has a lenient reputation. The game will see Wolves boss Paul Lambert face his old club for the first time since leaving in February 2015 on a day when the memory of Graham Taylor, who managed both clubs, will be honoured. You can see the rest of the EFL match official appointments for this weekend here. Tim Robinson will take charge of Friday’s west London derby at Griffin Park, before Paul Tierney will oversee Saturday’s televised early kick-off between Wolves and Derby at Molineux. TIM Robinson has been confirmed as the referee for the west London derby between Brentford and Fulham on Friday night. The 32-year-old, from west Sussex, will take charge of the first SkyBet Championship match of the weekend as the Cottagers seek a first victory at Griffin Park in 18 years, in front of the Sky cameras (KO 19:45 BST). He will be assisted by Andrew Fox (Warwickshire) and Mark Jones (Nottinghamshire), with James Adcock (Nottinghamshire) the fourth official. Robinson is becoming a regular on live TV and on Friday nights – having been on electronic board duties at Loftus Road for Brentford’s 2-0 win over QPR, which Adcock refereed, in another west London derby last week. Seven days earlier, he gave six yellow cards when in the middle for Burton Albion’s 2-0 win over Birmingham City at the Pirelli Stadium. His only other televised game this term came in September when he awarded penalties to both sides in Peterborough’s 2-2 draw with Swindon at the ABAX Stadium in League One. Swindon midfielder Michael Doughty admitted afterwards he had to ‘bite his tongue’ after Robinson controversially awarded Posh a free-kick, on the linesman’s advice, despite Doughty appearing to cleanly the ball off Marcus Maddison – who went on to score. The Select Group 2 whistler, who gave up his job as a PE teacher to become a full-time official last summer, will oversee his 14th match of the season in all competitions. Robinson has so far brandished 65 yellow cards, sent off three players and awarded three penalties – and it will be the second time he will encounter both sides in the Championship this term. He encountered the Bees in their 1-0 home win over Nottingham Forest in August, in which Forest defender Damien Perquis was dismissed for two bookable offences late on. Meanwhile, Robinson oversaw the Cottagers in their 1-1 draw against Burton at Craven Cottage in mid-September. In the same month, he was criticised by Wycombe boss Gareth Ainsworth for missing what he felt was a blatant handball in the build-up to Portsmouth’s third goal in their 4-2 victory over his side at Fratton Park in League Two. Robinson’s only previous experience of a west London derby came back in February in Fulham’s 3-1 win at QPR. He handed out four bookings at Loftus Road but QPR felt Dan Burn should have been sent off for bringing down Jamie Mackie as the last man. The Middleton-on-Sea official enjoyed a progressive campaign last season – in which he officiated 43 games in all competitions, 14 of which were in the Championship and six were televised. Robinson was fourth official for four Premier League games as well as the League Two Play-Off Final, and handled the League One Play-Off semi-final second leg between Millwall and Bradford at the New Den. Robinson – who is the chairman of the Chichester and West Sussex Sunday League – has been qualified for 15 years and progressed through the Sussex, Wessex and Ryman leagues having first taken up the whistle on the advice of his former PE teacher, Paul Blackmore. He ran the line in the 2008-09 Conference Play-Off Final at Wembley before gaining a place on the Football League list of assistant referees in the 2010-11 season. His first game as a National List referee was Southend against Accrington in League Two in August 2012. Premier League whistler Paul Tierney will take charge of the Midlands derby between managerless Wolves and Derby County on Saturday. The 37-year-old, from Lancashire, has been assigned to the televised lunchtime encounter at Molineux as Wolves’ caretaker boss Rob Edwards hopes to get the better of the Rams in his first home game in charge (KO 12:15 BST). He will be assisted by Andy Halliday (north Yorkshire) and Mark Scholes (Buckinghamshire), while Select Group 2 referee Chris Kavanagh (Manchester) will be on fourth official duties. It will be Tierney’s 11th game of the season in all competitions, having so far brandished 37 yellow cards, one red card and awarded two penalties. He had an assured top-flight debut in Swansea’s 3-0 win over West Brom in August 2014 and went on to officiate four other games before his promotion to the Select Group, along with Stuart Attwell, was confirmed this summer. The former hairdresser, who is the first referee from Wigan to officiate in the Premier League, has already handled Burnley’s 1-1 draw with Hull in September and Swansea’s goalless draw with Watford this term. He was criticised by Watford boss Walter Mazzarri after last month’s match at the Liberty Stadium for failing to award what he felt were two clear penalties for his side. Tierney was also labelled as “appalling” by then Bolton boss Neil Lennon at the start of last season when refereeing another derby in the Championship, in their goalless draw with Blackburn at Ewood Park. Saturday will be his fifth second-tier match of 2016-17 – and his second in front of the Sky cameras, after taking control of an incident-free stalemate between Derby County and Aston Villa in another all-Midlands affair at the iPro Stadium in August. Tierney, meanwhile, has not encountered Wolves for over a year since their 2-0 home defeat by Brentford in October 2015. His career highlights include running the line in a 2009 FA Cup semi-final between Chelsea and Arsenal, taking charge of the 2014 League Two Play-Off semi-final second leg between Southend and Burton Albion and being fourth official for the FA Trophy Final in the same year. Last season, he oversaw 46 games in all competitions, including both legs of the FA Youth Cup Final and Plymouth’s 1-0 second-leg win over Portsmouth in the League Two Play-Off semi-finals. Although allowing the game to flow as much as possible and largely avoiding controversy, Tierney has built a reputation for being a card-happy official during his six seasons as a Football League referee. The clash between the sides at Molineux was also officiated by a Premier League referee last season, as Graham Scott handed out five bookings when George Saville struck twice for their 2-1 win over Derby back in February. You can view the rest of the EFl match official appointments here. James Linington, David Coote and Graham Scott will take charge of the Severnside, Midlands and Yorkshire derbies respectively in the SkyBet Championship this weekend in front of the Sky cameras. JAMES Linington will be the man in the middle for Friday night’s Severnside derby between Cardiff City and Bristol City. The Isle of Wight official will be at the helm for Neil Warnock’s first game as Bluebirds boss when the fifth-placed Robins visit the Cardiff City Stadium to face the second-bottom team (KO 19:45, live on Sky Sports). He will be assisted by Steven Meredith (Nottingham) and Neil Davies (London), with Tim Robinson (west Sussex) on fourth official duties. Linington encountered both sides in the first month of the season in the Championship. The 37-year-old awarded QPR a late penalty to help them beat Cardiff 2-0 in south Wales in August, before booking eight players in Bristol City’s 3-1 victory over Aston Villa at Ashton Gate two weeks later. Overall, he has issued 39 yellow cards, sent off one player and awarded three penalties in seven games this term – five of which have been in the Championship and two EFL Cup ties. Linington was due to take charge of Derby’s televised match with Newcastle at the iPro Stadium last month but was injured in the warm-up and replaced by the fourth official, Darren Bond. Linington has probably been the biggest beneficiary of the 18 referees who turned professional in Select Group 2 over the summer. The Newport-based whistler has to travel the furthest to get to games by catching the ferry from Fishbourne port across the Solent before making the rest of his journey by car. He will be hoping to stay on the right side of new Cardiff manager Warnock, who has had many a run-in with referees during his career despite being a qualified official himself. Linington took up the whistle at the age of 14 before giving up football playing as a winger because he was told he was ‘not strong enough’. He has been a Football League referee since 2008 – having spent two years as a Select Group linesman, during which he ran the line in the 2006 League One Play-Off Final at Cardiff’s Millenium Stadium. But Linington’s biggest honour to date came when refereeing Dagenham & Redbridge’s 3-2 win over Rotherham in the 2010 League Two Play-Off Final at Wembley. David Coote has been confirmed as the referee for Aston Villa’s clash with Midlands rivals Wolves on Saturday. The Select Group 2 official has been put in charge of the evening game at Villa Park when managerless Villa welcome Walter Zenga’s Wolves (KO 17:30 BST, live on Sky Sports). Coote will be able to call upon the assistance of Shaun Hudson (Tyne & Wesr) and James Wilson (Cheshire), while Andy Madley (west Yorkshire) will be on electronic board duties as fourth official. The West Yorkshire whistler has been among the busiest in the Football League so far this term, having refereed 11 games and been fourth official for nine others. He has dished out an average of three yellow cards per match, sent off Reading’s Garath McCleary in their 2-1 win at Barnsley and pointed to the penalty spot three times. Coote has never officiated an Aston Villa game before but was in the middle for Wolves’ 2-1 defeat against Leeds at Elland Road in April last season. It will be his second TV game and major derby of the campaign after impressing in his first ever East Anglian derby at Portman Road in August – issuing just one booking in Ipswich’s 1-1 draw with Norwich. Cricket-loving Coote, originally from Nottinghamshire, first took up the whistle at the age of 14 before progressing to become a Football League referee in 2010. He has had five trips to Wembley as a match official – his most important as the man in the middle for the 2014 League One Play-Off Final when Rotherham beat Leyton Orient on penalties. It will be the sides’ first meeting since Villa won 3-2 at Molineux in the Premier League in January 2012. Graham Scott has been assigned to Sunday’s Yorkshire derby between Huddersfield Town and Sheffield Wednesday. The 48-year-old will be in charge as the current leaders host their south Yorkshire neighbours in what promises to be a competitive contest at the John Smith’s Stadium (KO 12:00 BST, live on Sky Sports). He will be assisted by Dave Bryan (Lincolnshire) and Matthew Wilkes (west Midlands), as well as fourth official Oliver Langford (west Midlands). Scott will handle only his eighth match of the season – and fourth in the Championship so far. He has brandished 26 yellow cards, sent off Gillingham’s Ryan Jackson in their 1-1 League One draw with Bradford, and awarded three spotkicks. The Oxfordshire whistler was promoted to the Premier League after six seasons in the Football League in the summer of 2015. But he has since received only six top-flight matches – with his only one this term coming last month in Tottenham’s 2-1 win at Middlesbrough, in which three players were cautioned. It will be his second TV match of the season after putting in a good display in Leeds’ 2-0 win at Cardiff last month, also in the second-tier. He awarded the visitors a spotkick under the new shirt-pulling directive at a crucial time after Matthew Connolly hauled down Pontus Jansson, which allowed Chris Wood to open the scoring at the Cardiff City Stadium. The Abingdon-based official, who has also been fourth official for four games this season, encountered Huddersfield twice last season – in both of their West Yorkshire derbies against Leeds United. He stayed under the radar during Leeds’ 3-0 win at the John Smith’s last November but booked eight players and awarded Huddersfield a penalty, which Nakhi Wells missed, in their 4-1 win at Elland Road back in March. Scott controlled three Wednesday matches last term – their goalless draw with Derby in December, a 3-0 win at Nottingham Forest in which he dismissed Barry Bannan in March, and their memorable 3-0 triumph against Arsenal in the League Cup. Darren Deadman will return to the middle this weekend, despite his poor display in Wimbledon’s 3-1 win at Oxford in League One last Sunday. You can view a full list of Football League match official appointments here. Middlesbrough regained top spot in the SkyBet Championship as Gaston Ramirez inspired them to victory over a lacklustre Wolves at the Riverside Stadium. MIDDLESBROUGH returned to the SkyBet Championship summit as Gaston Ramirez scored twice in a dominant victory over Wolves. The on-loan Southampton forward, one of five players recalled by Aitor Karanka, stooped to head home Adam Clayton’s cross in a one-sided first half that Boro dictated. His second was a stunning curler from the corner of the box early in the second half after exchanging passes with stand-in skipper George Friend. A lacklustre Wolves pulled one back four minutes from time when substitute Joe Mason’s header deflected in off Ben Gibson, who was credited with an own goal, but their first goal in four away games was too little too late. Karanka’s side held on to move two points above Burnley, who host east Lancashire rivals Blackburn in Saturday’s early kick-off, as they bounced back from the surprise midweek defeat at Ewood Park to earn only a second home win of 2016. Wolves arrived in buoyant mood after ending their seven-game winless run against Derby last weekend but were deflated by a confident Boro as Kenny Jackett’s men remain without an away win since New Year’s Day. Boro opened brightly, in contrast to the chilling Teesside temperatures, as the impressive Albert Adomah twice came close and Tomas Kalas fired off target in the first 10 minutes. Wolves struggled to set out their stall and were further unsettled by the loss of Ethan Ebanks-Landell to a hamstring injury after just 18 minutes. The breakthrough came just six minutes later when Ramirez stole in at the back post to head Clayton’s cross into the bottom corner from four yards as Wolves could not sufficiently clear an initial free-kick. Although desperate Wolves defending prevented further Boro opportunities, the hosts completely bossed the first period and Ramirez curled straight at Ikeme shortly before the break. There was no immediate change in pattern in the second half, which was only 21 seconds old when Jordan Rhodes’s header from an Adomah centre was turned over the bar superbly by Wolves keeper Carl Ikeme. Rhodes – who has now scored once in seven Boro appearances since his £9 million move from Blackburn – then rifled another effort over when collecting Adam Forshaw’s pass on the edge of the box. The night, though, belonged to their other major January recruit as Ramirez doubled his money with a delightful curling shot from 18 yards which deceived Ikeme’s despairing dive. It was a timely tribute in the 56th minute to the ‘voice of Boro’ Ali Brownlee, the BBC Tees commentator who lost his battle with bowel cancer last month as the home faithful chanted his name vociferously. Boro, in cruise control, continued to entertain their supporters with the kind of attractive brand of football that you would expect from serious promotion contenders. Rhodes flashed another header off target after a well-worked move before right-back Emilio Nsue was inches away from finding the far corner with an ambitious right-footed effort. Wolves belatedly introduced their £3 million January signing Joe Mason in place of an unusually quiet Nathan Byrne. The former Cardiff striker had their first meaningful effort midway through the half but his free-kick did not trouble Dimi Konstantopoulos. The Greek stopper was finally forced into action on 71 minutes to shovel behind a tame effort from Jeremy Helan, in his second Wolves outing since joining on loan from Sheffield Wednesday. The return of Jack Price from the bench to ease Jackett’s injury list was one of few positive notes for a Wolves side who were second best throughout. Mason managed to pull one back with a glancing header which looped in off Gibson’s back to give Wolves a late lifeline. But Boro deserved the three points as they capitalise on Hull’s defeat at Birmingham on Thursday and become the frontrunners once again in the automatic promotion race. Not used: Agazzi (GK), de Laet, Fry, Sola, Downing, Nugent. Substitutes: Hause (on for Ebanks-Landell 18′), Mason (on for Byrne 65′) and Price (on for McDonald 79′). Not used: Martinez (GK), Deslandes, Hunte, Le Fondre. Andy Davies will take charge of Cardiff City’s televised Championship match with Wolves in Saturday’s evening kick-off while Lee Mason and Mike Jones have also dropped down from the Premier League. REFEREE Andy Davies will take charge of his first televised match in the SkyBet Championship on Saturday evening when Cardiff City host play-off chasing Wolves. The 39-year-old will be in the middle at the Cardiff City Stadium for the teatime game in the fourth round of Football League fixtures in 2015-16 (KO 5:15pm, live on Sky Sports 1). He will be assisted in south Wales by linesmen Simon Knapp and Dumitru Ravel Cheosiaua while the fourth official will be Stephen Martin (Staffordshire). The Hampshire-based whistler is in his fourth season on the National List since earning promotion from the Conference at the start of the 2012-13 campaign. It will be Davies’ third game of the season after handling Birmingham’s 2-1 League Cup win at Bristol Rovers and Walsall’s 2-0 victory at Southend in League One last weekend in which he has issued six yellow cards and no reds. Davies oversaw his first second-tier game in October 2013 and sent off Bournemouth’s Elliott Ward in their 2-1 defeat at title winners Leicester City. Although often found in Leagues One and Two, he has since officiated 15 more Championship matches including 10 last season. Oveall, Davies oversaw 30 games in all competitions in 2014-15 – brandishing 105 yellow cards, sending off seven players and awarding five penalties. Davies last encountered Cardiff in their 2-1 win over Brentford in mid-March and sent off Bluebirds forwards Kadeem Harris and Federico Macheda late on at Griffin Park. His only game involving Wolves came last October in their 2-2 draw against Wigan Athletic at Molineux when he issued five yellow cards in an incident-free game. Davies is a former Portsmouth, Gillingham and Yeovil footballer who had to stop playing at the age of 28 due to injury and instead took up the whistle in 2003. 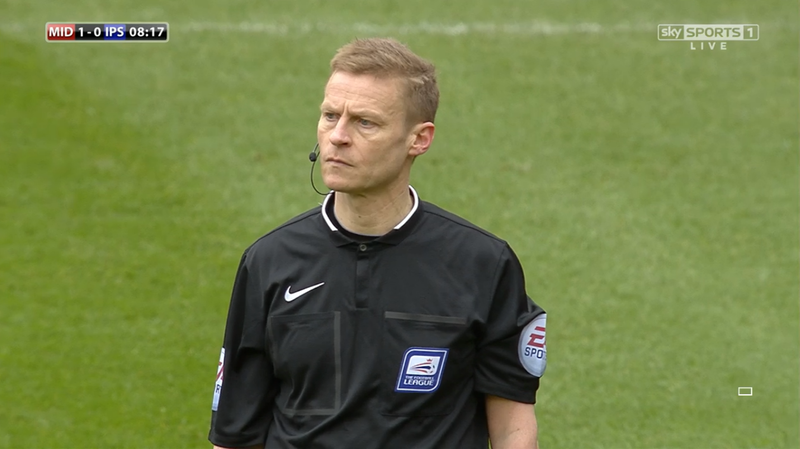 Friday night’s match between Birmingham City and Derby County will be refereed by Premier League whistler Lee Mason (KO 7:45pm, live on Sky Sports 5). The 43-year-old from Lancashire has overseen two Premier League matches so far – Leicester City’s 4-2 win over Sunderland and Arsenal’s 2-1 victory over Crystal Palace. But neither performance has been convincing and the Bolton-based official was criticised for failing to send off Gunners midfielder Francis Coquelin for persistent fouling at Selhurst Park last Sunday. Mason – who handled 25 top-flight games last term – will also be the fourth official on Saturday for Leicester’s match with Tottenham at the King Power Stadium. At St Andrews, he will be assisted by Peter Wright and Select Group linesman Derek Eaton with Gary Sutton (Lincolnshire) in charge of fourth official duties. Fellow Premier League referee Mike Jones will also be on duty in the Championship on Saturday lunchtime when Leeds United take on Yorkshire rivals Sheffield Wednesday. The 47-year-old from Chester will be assisted by Timothy Wood, Jonathan Hunt and fourth official Darren Bond for the 12:30pm kick-off (live on Sky Sports 5). Jones has already taken charge of two Premier League games – Everton’s 2-2 draw with Watford and Swansea’s 2-0 win over Newcastle when he sent off Magpies defender Daryl Janmaat for two bookable offences. The Chester-born official ended last term with five successive top-flight matches but oversaw 10 Championship games during 2014-15. He has, however, been the centre of controversy on a number of occasions including the infamous beachball incident at the Stadium of Light in 2010, booking Sergio Aguero for diving when he was clearly fouled at Southampton last term and awarding Liverpool a penalty against Leicester when the ball clearly struck Wes Morgan in the face. WOLVES manager Kenny Jackett is targeting his 50th victory in charge of the Molineux club against Nottingham Forest on Good Friday. Three points at the City Ground could take the play-off chasing Midlands outfit into the top six depending on results elsewhere. Former Millwall boss Jackett – who took over in May 2013 following the sacking of Dean Saunders – guided Wolves to the League One title last term which included a club-record run of nine consecutive wins. Wolves won 31 league matches – including 17 of their last 21 – in 2013/14 on their way to clinching top spot in the third tier after back-to-back relegations. They have already recorded 18 in the current campaign – and another win over Dougie Freedman’s Forest away from home would be the 50th under Jackett’s stewardship. “To get my 50th win would be great; my time has gone very quickly, which is probably a good sign suggesting I have probably enjoyed it. “I’ve been here almost two seasons, but it’s gone very quickly, and we’re really looking for that big finish to the second season now,” the Welshman added. The former Watford midfielder has also enjoyed success in his extensive managerial career at Swansea City and Millwall, winning promotion to the Championship via the play-offs with the Lions in 2010. Jackett was named League One manager of the year last term and claimed the Championship’s monthly managerial award back in August after a promising start to the campaign. Wolves are currently eighth in the table, two points adrift of the play-off places, with seven games remaining but have lost just one of their last eight league outings. On Wednesday, defender Richard Stearman and midfielder Kevin McDonald were both named in the Football League Team of the Month for March.